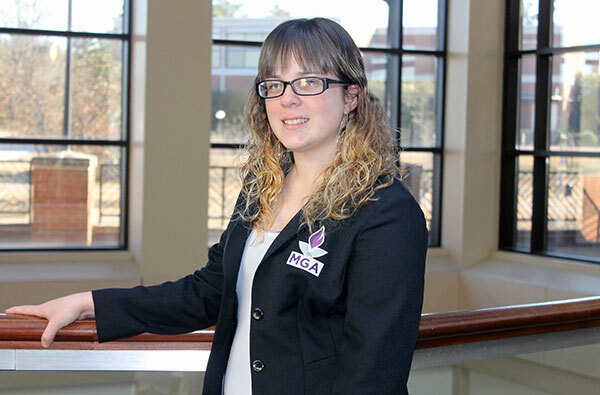 One of MGA's most active and accomplished students, graduating senior Lizzie Mathias plans to begin her career as a social worker helping children. Full Name: Susan Elizabeth "Lizzie" Mathias. High School: Johnson County High School, where she participated in Family, Career and Community Leaders of America (FCCLA), Color Guard, and Choir. Family: "I like to think I have three sets of parents; my parents, Scott and Janice Mathias; my best friend's parents, Michael and Stacey Brooks; and my academic parents, Drs. Stephen and Kara Svonavec of the MGA faculty. All of these individuals have helped moved mountains to ensure I received the best education possible, and for that I will be forever grateful." Current Employment: Middle Georgia State University Office of Career Services Student Assistant, Cochran Campus. Primary Campuses: Macon and Dublin. Activities: All-In Campus Democracy Challenge steering committee; Campus Activities Board, Dublin Campus; Peer Career Advisor; President's Torch Society member; President, Student Government Association; United Student Leadership. Career Goals: "My ultimate goal is to become a social worker. My best friend's family, which is like my own, took in three foster children in April 2016. This opened my eyes to a whole new career field that paralleled with my lifelong goal of helping change the lives of children for the better." She chose Middle Georgia State University because … "It was close to home and allowed me to receive an education while offering many opportunities to make a difference at the University and within my community." The greatest thing she discovered about Middle Georgia State was … "All of the amazing opportunities students have to get involved and be more than parking lot students - those who go from the parking lot to class, then immediately back to the parking lot. The Office of Student Life serves students with amazing opportunities to get involved both on and off campus, and for that I am eternally grateful. Those opportunities are what have gotten me to where I am today." Her greatest academic experience as a Middle Georgia State student has been … "Being able to attend one of our smaller campuses. The Dublin Campus is full of great students, and an even greater faculty and staff that work to make an educational experience every college student dreams about. I am a firm believer that bigger is not always better. The Dublin Campus has many great things in store for them in the years to come." To her, “greatness” means … "No individual participating in college is anywhere near the same person they were when they walked through the doors on the first day of class. We all came to Middle Georgia State University with the mindset of changing our lives for the better by obtaining an education that would set us apart from the rest of society. Our institution's slogan is simple: 'Find Your Greatness.' By being enrolled here with the goal of walking across the stage at commencement, we have found our greatness." In five years … "I see myself returning to Middle Georgia State University to work on a master's degree. I intend to work with the Department of Family and Children Services as a social worker to help change the lives of children who are unable to change their situation alone. I want to be a voice in the dark that shines a light for those who are unable to speak for themselves."